Hi, We are happy to share our latest news. After launching our beta product in August, we have 200+ downloads of our Android App, many active users and have begun receiving & processing initial MSME applications for loans, savings and transactional accounts. In the past 6 weeks, we enhanced features and functionalities with several design sprints, particularly thanks to working closely with users and learning about their experience and behaviors. We've also started working with more financial service providers (FSP) focused on MSMEs, including banks and savings and loans (S&L) institutions. Weekly, we see continued growth in App downloads and active users; we currently have 200+ downloads of our application and many registered digital profiles. We have received and processed over a dozen banking applications and work with our FSP partners - banks, S&Ls, and MFIs - to ensure digital account opening success. Among the applicants, the majority have never had a bank account or credit for their business nor understood the options available to them. With our various partners that support the MSME sector, we have thus far presented to over 300 business owners in the Greater Accra area. We are thrilled to announce that we have received a pre-seed investment from EWB Ventures (Engineers Without Borders). EWB Ventures brings a wealth of experience on the ground in Africa along with talent expertise, both of which will prove invaluable as we grow. We plan to use these investment funds to further develop the product and bring on critical talent to grow adoption and manage FSP partnerships. 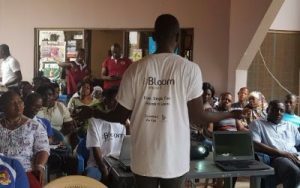 Operations Associate, George Acheampong, explains Bloom Impact and digital access to finance to business owners. In October, the Bloom Impact team conducted a promotional training event for roughly 60 small business owners in partnership with the Association of Small Scale Industries (ASSI) - an important national organization that helps the MSME sector with training, marketing, advocacy and other services. At the event, we talked about how to digitally access financial services, the importance of using savings and transaction accounts, and how to be eligible for credit when needed. We demonstrated the value proposition and functionality of our App, educated attendees on the different types of financial products offered, and helped participants create their digital profiles. Most attendees downloaded the App during the event and began actively engaging and learning about financial services. Meet Vida, a recent Bloom Impact customer. Vida has been running a profitable small beauty salon in a suburb of Accra for over 15 years. 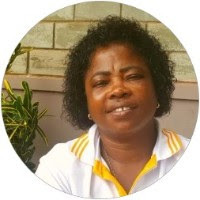 But recently her husband fell ill and lost his job and as a result, Vida had to take care of all the family expenses and her business began to suffer. By using Bloom Impact on her phone she learned about credit options on the market and applied for her first business loan to gain working capital and make needed equipment and stock investments. Helping unbanked small businesses is an important part of our mission to ensure healthy, stable local economies.